Am I runner? A “real” runner? Most runners I know ask themselves this question frequently. I wonder this about myself daily. As if there is some objective way to know, as if I will ever be able to prove myself enough, as if anyone’s definition of me matters more than my own. But: am I runner? When will I know? At what mileage? At what pace? After how many races? For most of these 22 months, as I have fought the good fight to redefine myself and to claim the courage to be fully the person I have wanted to be, I have nonetheless been plagued with that question. 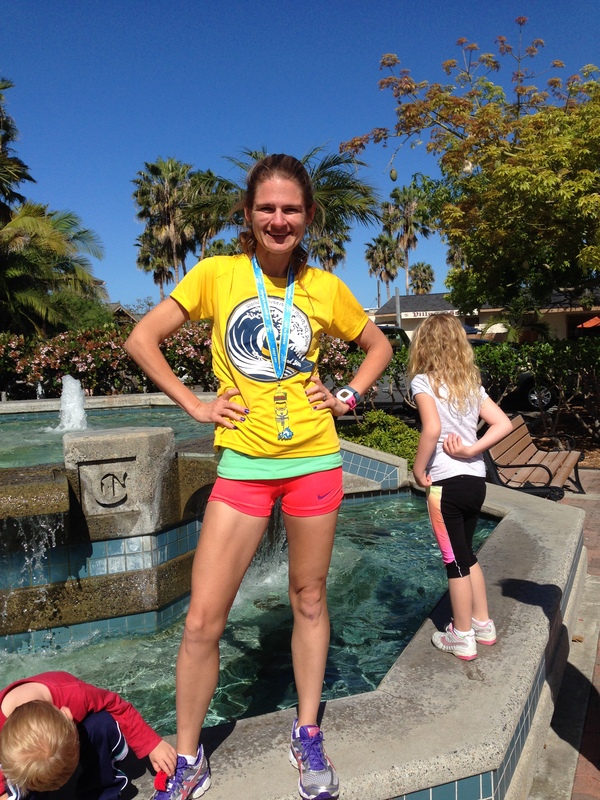 Does finishing a half marathon make me a runner? If I run three days a week, four days a week, five days a week, is that it? 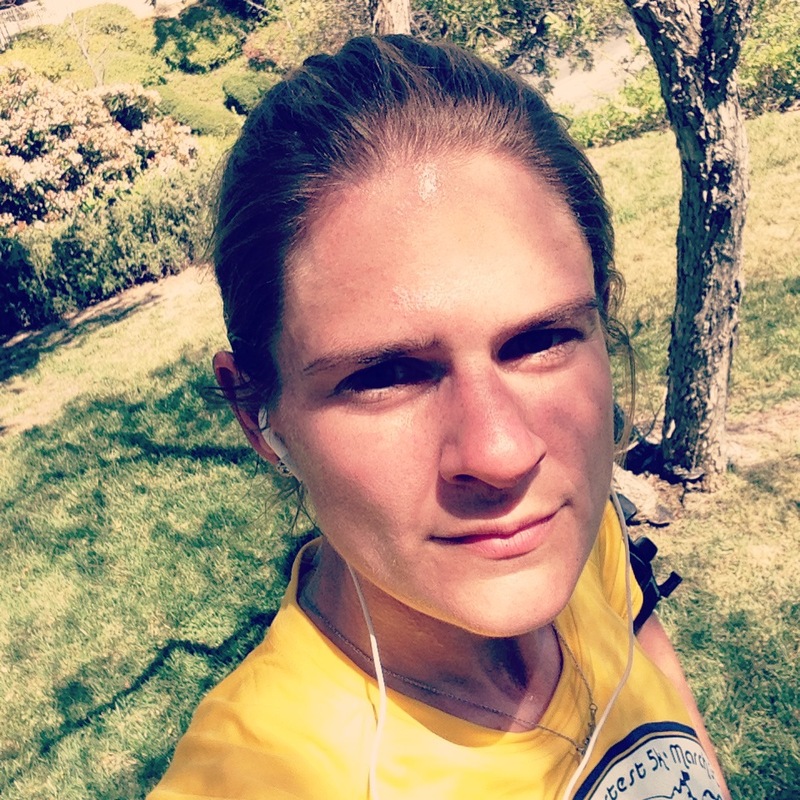 What do other runners mean exactly when they talk about joggers versus runners? It’s been an insane, intense two weeks of training, tapering, and nerves. Excitement, too. Pride. Hope. Hard work. Fear. Bravery. For my birthday in December, Bill gave me entry fees to two races and one hotel stay. 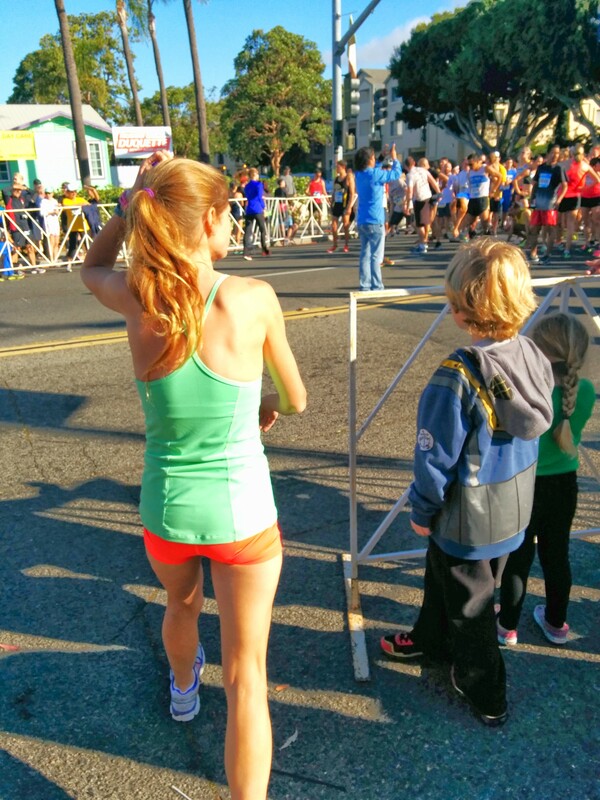 I raced the Hot Chocolate 15K last Sunday, and today had the Carlsbad 5000 scheduled. At times this past week I wondered what the heck my coach and I were thinking racing back-to-back weekends, one a distance and one more of a sprint. But if we risk nothing, we can achieve nothing. After last Sunday’s race, Coach Husband gave me Monday off. 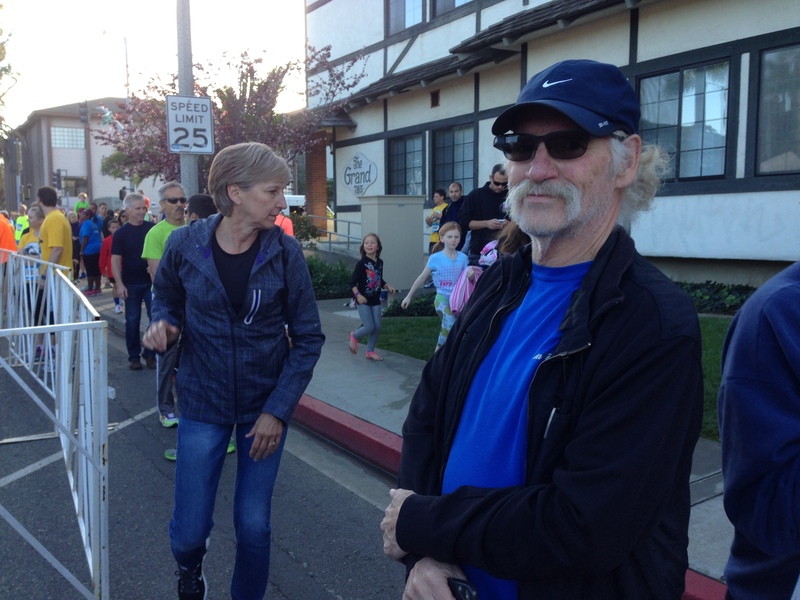 I was loony enough to ask him Sunday afternoon what I was running on Monday, and after looking at me like I was stark raving, Coach Husband reminded me to wait until my adrenaline wore off to feel my legs…and holy cow. I had worked them with my pacing, and I ended up desperately needing Monday to recover. On Tuesday, he gave me 3 miles easy. On Wednesday, we did intervals: 8 X 440. He wanted a 1:45.0 pace minimum, but I showed up with 1:33.0. And then a 4.2 mi run at a comfortable pace. On Thursday he gave me 6 mi (thank goodness! ), but on Friday I was tapering off with 2.0. Yesterday I had to rest completely. My legs never felt fully recovered, but I decided to ignore that for today and go in with all guns blazing. I was so thankful for Wednesday’s intervals, because my body really needed to feel that pace for a sustained length of time, and it was those intervals specifically that gave me confidence today to go for it. So how did it go officially? I had set a goal for myself of 20:30…or better. 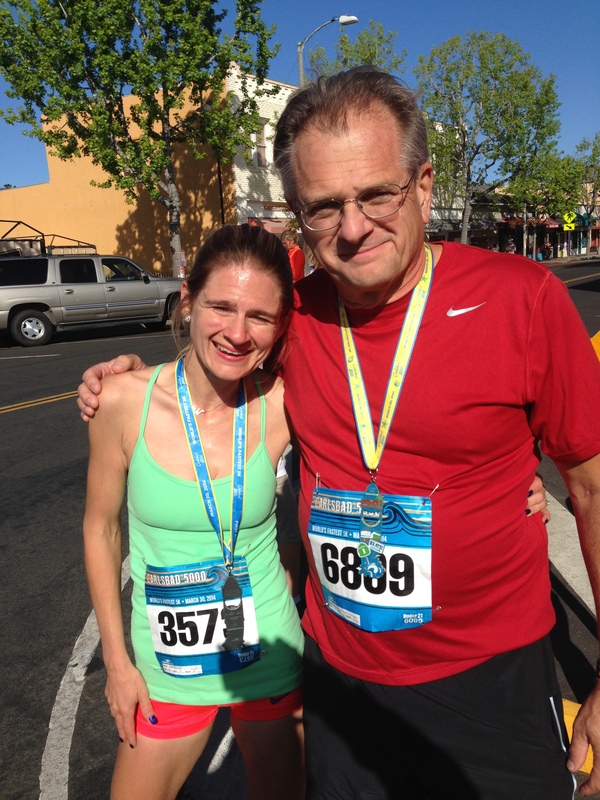 I was secretly going for sub-20, and Coach Husband kind of sensed that, too. My official time was 19:52 for 3.1 miles. My pace was 6:24. My first mile was 6:11, and my second mile was 12:21. 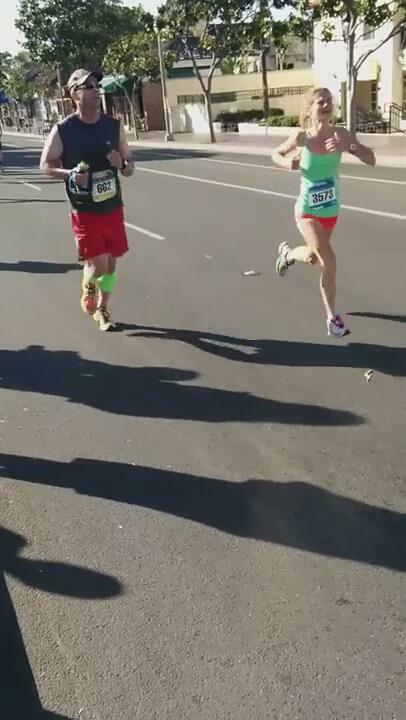 I was the 18th woman to finish in my division out of 266, the 35th out of 755 for my gender, and overall in my wave 135/1511. Room for improvement? Certainly. But this was also a race with some different kinds of competitors thrown in the mix, too. As in: super fast ones. I am extremely happy with my PR, which represents so much growth for me, but I am left even hungrier for gaining speed than I was before. 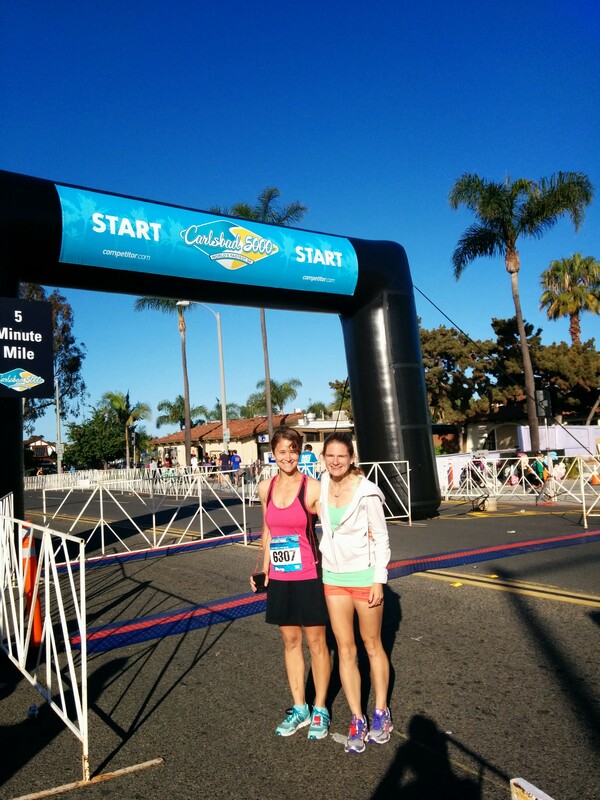 My goal next year is to race the Carlsbad 5K in the high 18s, for starters. I am not easily satisfied with any performance I ever give in anything, and never have been, which is one of my strengths but which also makes me vulnerable to myself. Coach Husband is extremely important in those moments. I was so nervous going into this race, because I wanted to PR so badly and to PR by a certain amount. I could barely sleep last night and was projecting the race over and over again in my mind, thinking about my legs and pace and how I wanted to will them to go. This is one of the reasons I run in the first place: to feel alive and use my time to live in as much of a glowing blaze as I can live. I knew I would have to face the pain and stare it down if I wanted to go as fast as I went today, but it is the facing of that pain that helps to give life meaning. We can choose to avoid suffering and fear, as runners or as people living our daily lives even if we don’t run; but if we choose avoidance, we lose the chance to conquer ourselves and to give our lives purpose. I refuse to be stifled by inertia or fear. I will live, I will live, I will live. I shall use my time on Earth, because that’s all I have coming to me. And knowing this full well, I will live, I will live, I will live. It is, in fact, this knowledge of my life’s impermanence that makes it possible for me to feel as much joy as I feel just being alive each day. When we know that we will end, everything takes on a sort of passion and vibrance. Nothing is for granted. I have always known this, but running has made this truth all the more clear to me. We have only these miles and a stretch of road that ends far off in the horizon: we have to make it count, now. The gun went off, and there was not much time to ramp up into my pace. In fact, I felt this race was more like a sprint! 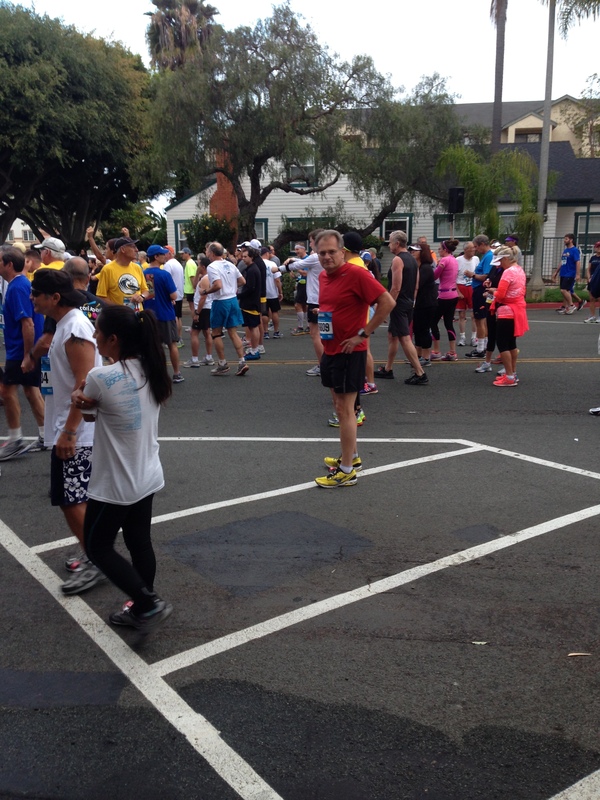 The Carlsbad 5000 is known as “the fastest 5K in the world,” and I believe it. My strengths reside in the longer distances, where I am mentally very tough and, to be honest, more mentally trained. To run extremely fast for a short time is a different kind of beast. There is no way to make up for a slower start later. It’s all or nothing, from the gun, it seems. I was hurting after two miles, and my pace slowed but never dipped below my target time. I spent the last mile chanting the words of the great Prefontaine to myself, “Do not let fatigue make you a coward. Do not let fatigue make you a coward. Do not let fatigue make you a coward.” I love Pre. I told myself that I could endure almost any pain for 3.1 miles, and indeed, that scenario played out. I never quite let the bear get on me, but we were probably close! 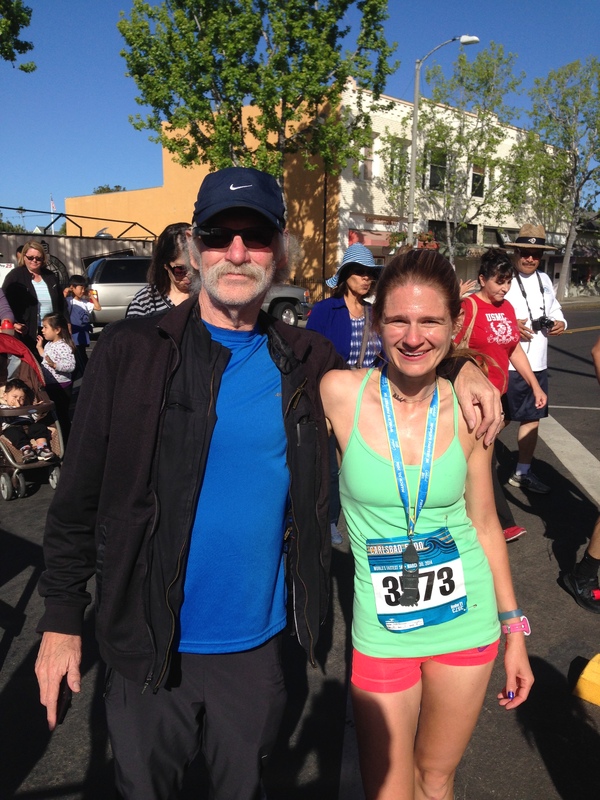 My friend Susan, whom I have always admired tremendously since first meeting her as a colleague at TVHS, also ran today! I love everything she stands for, and we keep up with each other on Facebook, but I haven’t seen her in person for quite some time. I was so excited to SEE her! My dad made his racing comeback today after being out with injury for almost two months. He hasn’t been able to train, even. His doctor gave him an all-clear on Thursday. I am overjoyed that he is back and ready to race. I have missed him and felt his absence keenly, and I have been feeling empathetic despair at his not being able to run. Runners need to run. I am so glad he is back, and I am so proud of him, too. Bill and Ruth Wysocki. If you are a track and field nerd, you will understand why this is cool. She actually lives in Temecula, and I have seen her at my corner market. I am a bit starstruck by her. Finally, running together again! One of the many traits I love about my dad is that he has that ability to look his fears straight on and to absolutely slaughter them. He’s a courageous one, this guy. So proud always to be his daughter. Coach Husband, thank you again for yet another great race. I put all my trust in you, and you have never mishandled that trust. Not only that, you keep me from going TOO crazy with nerves. You understand what kinds of pressure I put on myself in all areas of my life, and you help me remember how to treat myself gently even when working hard. We were playing around a bit before the invitational races. Katie helped me pick out my colorful spring ensemble, and the yellow shirt was swag. I painted my nails purple this time. I always paint my nails a wackadoo kind of color before a race, or when I am fighting for PRs in my training. If you ever see my nails a little colorful? It means I am fighting for some personal goal at the moment, one that I might not even be talking about. Crazy color nail polish started as a way of acknowledging that I am “in character” as a runner. Am I runner? 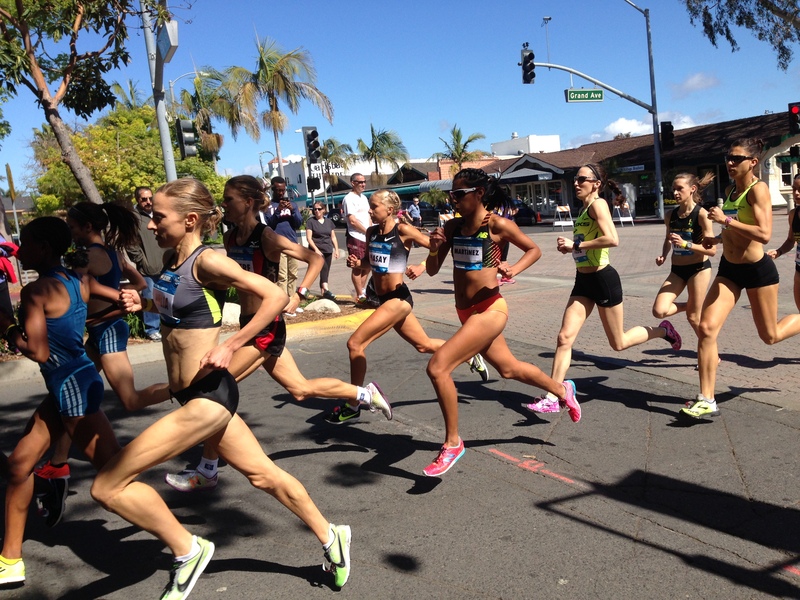 The women’s invitational: Jordan Hasay, Gabe Grunwald, Brenda Martinez, Julia Bleasdale… The intensity of their race brought me to tears at the finish line. As I watched them give everything to the point of doubling over when they came in, I felt an emotion beyond words. Their athleticism is incredible to see in real life, not just on the television. I’ve been watching Hasay for years, and to see her in person today: unbelievable. Their strides and musculature take my breath away. And I know how hard they work, work, work. Inspirational, truly. 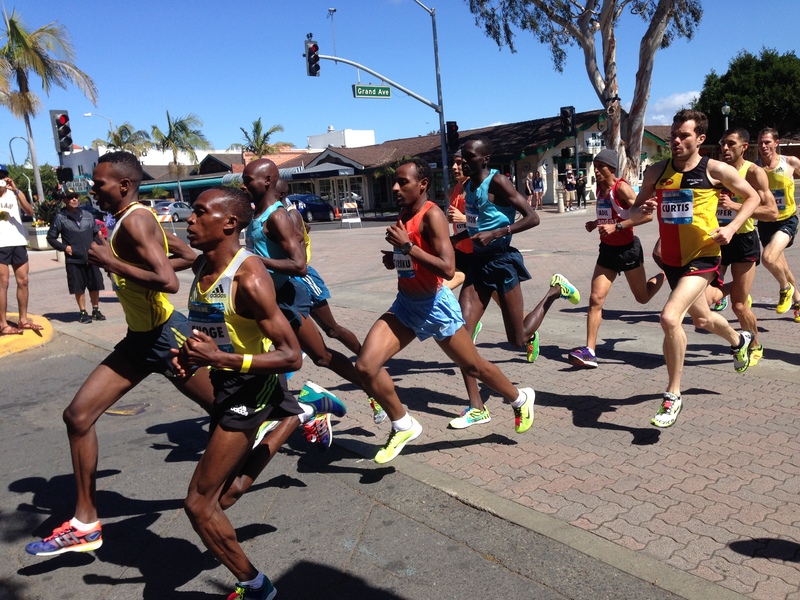 Bernard Lagat was going for the American record today…and took it! We saw history made this afternoon. So very, very awesome. Later this afternoon, Katie did some training of her own. 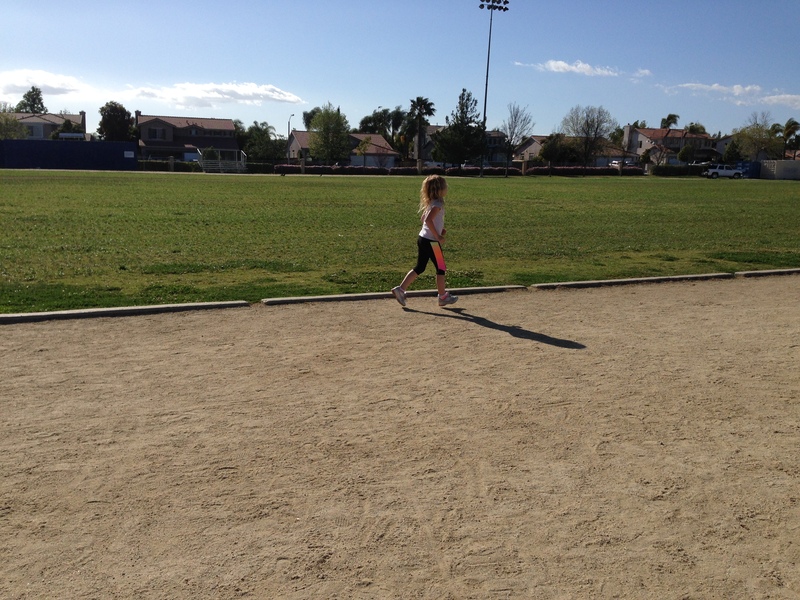 We’ve been training this week, as she is signed up for a 2K in April. 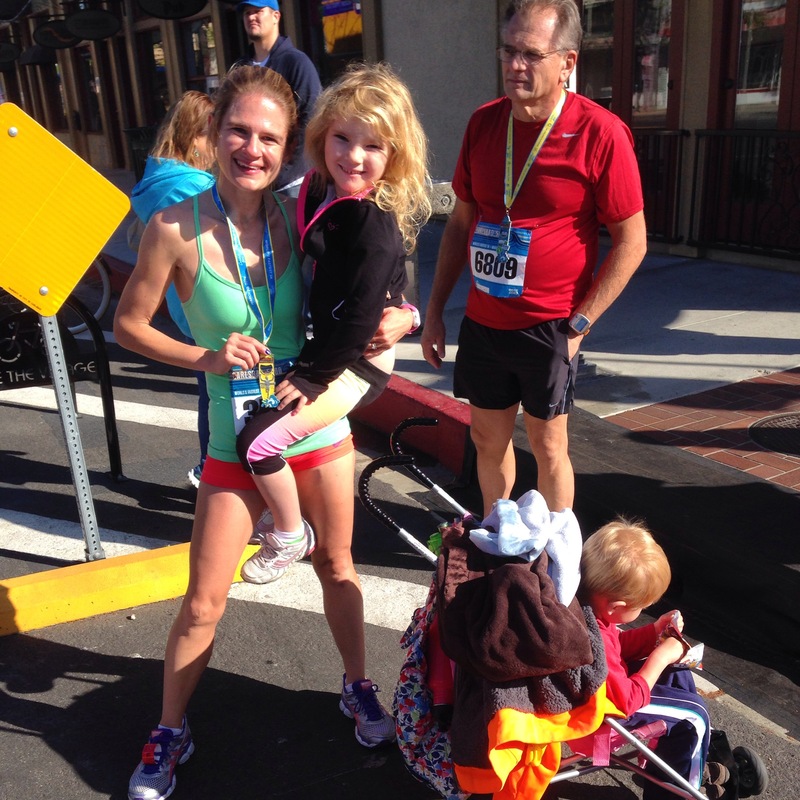 Much of the fam is running in April at a Temecula race. We are all doing different distances, but we’re looking forward to being there together. Dad is helping Katie through the 2K, I am doing the 10K, and my brother and sis-in-law are running the 5K. Entering my corral and nervous as all heck. When I was younger and felt these kinds of nerves for Academic Decathlon or Mock Trial, I hardly knew what to do with them. As I have gained experience, though, I have realized that nerves are a sign of sincerity, that what we’re doing matters to us. I try to use them to help focus me. So when the gun went off, my mind was laser-focused. Bill asked me later about the scenery for this race. I had to laugh. What scenery? I was vaguely aware of the beach to my left at one point, but I wasn’t looking! This was also the first race I’ve done without music. I wanted nothing to fight with the tempo of my body. I wanted to hear the sounds of the race, and of my breathing, and of my footfalls to help guide my pace. This was new for me, and it seemed to work out well. I will need to decide what to do about the 10K. Music or no music? Music can really aid long distances, but it can also be a distraction. I am going for a 42:00:00 10K some time within the next few months. I don’t know if that’s doable on the April course, since I haven’t seen elevation charts, but we will see. So back to my question: am I runner? I am not sure that any distance, pace, or time in a race can tell me that for sure. To know, I have to look deep within. What is a runner? What is the heart of a runner like? I think a runner is someone who looks at her performance and wants to give more. I think a runner is someone who faces fear daily and wants to keep charging headfirst toward her limits, or what she believes to be her limits, so she can challenge them. A runner cries, a runner celebrates, a runner feels joy and pain together. A runner does not give in to herself, when she has a million reasons going through her head not to run. Am I a runner? When I got home, I took a 5.1 mile celebratory lap at a comfy 7:25 pace around my hometown. Because although I PR’d at 19:52 and came in 18th in my division, I know I can do better. Because training for next year starts RIGHT NOW. Because I am a long distance runner, and today is my long run day. Because I am my work ethic. Because I am tired of tapering two weeks in a row. Because I believe in myself and the ability I have to pull myself along in this life. Because I want to know my limits, and through knowing my limits, to know myself.